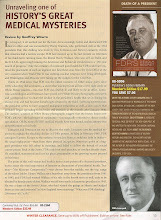 Fdr's Deadly Secret: Yet Another Small Piece of the Puzzle. The Report of Fulton Oursler. The fact that persons were able to gain side door entrance into the White House is more troubling than FDR's condition. What other secret portals into the inner workings of our government did Stalin's clandestine agents have? Read "Stalin's Secret Agents," by Evans & Romerstein. Elizabeth Bentley (former courier for Soviet agents of influence working in high levels of our government) testified that after an agent got into a position of prominence in our government, he or she would use their position and/or influence to open portals for others to gain entry into (and employment in) sensitive areas of our government.